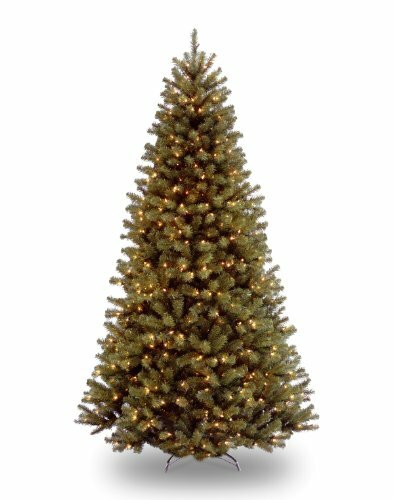 Featuring low-voltage Dual Color LED lights, this spruce tree will really set you apart. Change the color of the lights on your tree from soft white to multi-color with the tap of the included foot switch. LED bulbs are long lasting and energy efficient. This spruce tree is 7.5 feet tall with a 52" diameter and features 550 UL listed pre-sturng lights. The hinged branches make assembly a snap and a sturdy metal tree stand is included. Our lights feature BULB-LOCK to keep bulbs from falling out. The tree is fire resistant and non-allergenic. National Tree provides a 5-year tree warranty and 3-year lights warranty. Assembly instructions, spare bulbs and reusable storage container are also included.